How to keep greens from wilting! Don't you hate when you buy your salad mixes, greens, or herbs and it seems in just a short few days they turn all soggy and yuck?! Eww, ain't nobody got time for that! So here's a tip to keep your greens crispier longer! 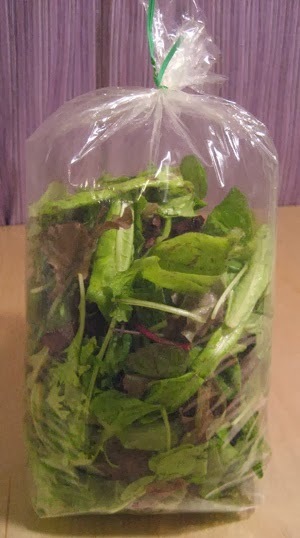 Divide your big container of greens into two to four smaller plastic bags. Close the top of each bag lightly with your fist, blow into the bag, and fill it with air (carbon dioxide). Then seal the bag by twisting the top a few times before closing it firmly with a twist tie. Place it in the fridge, and your greens are good to go. These puffy bags might take up a little bit more room in your fridge, but the loss of space is worth it; your greens will stay bright, crisp, and flavorful, so you can enjoy healthy salads, smoothies, and sandwiches all week long. This tip works for all leafy greens, including herbs; just be sure produce is completely dry before placing them in the plastic bag. Don't worry about wasting plastic bags since these can be washed, air-dried, and reused for next time. For an added tip, toss in a paper towel before you seal it up. That will absorb extra moisture!